A statement from General Ibrahim Badamasi Babangida's family announced today that Maryam passed on early this morning at the age of 61, after a protracted illness. The former chairperson of the Better Life for Rural Women during her husband's years in office had been hospitalized at the University of California Los Angele's (UCLA) Jonsson Comprehensive Cancer centre in Los Angeles California, United States. She died beside her husband, General Babangida who has been at her bedside in the US hospital. Mrs. Babangida's condition worsened months ago. Born on November 1, 1948, she had fairly humble beginnings in her hometown of Asaba where she received part of her early education before moving up North to Queen Amina College, Kaduna for her Secondary education. She went on to graduate as a Secretary at the Federal Training centre, Kaduna and later obtained a Diploma in Secretaryship from Laselle University in Chicago, USA as well as a Certificate in Computer Science from the NCR Institute, Lagos. Considered to be one of the greatest women in Africa, Maryam made that significant sacrifice in her staunch belief that the family unit is the most crucial factor in the quality of society and of mankind and that the woman is the central anchor of the unit. By 1983, she however was again ready for an active career, beyond the confines of the home front when her husband became the Chief of Army Staff on December 31st that year. 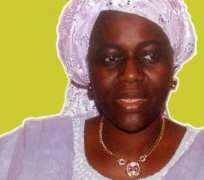 She became the President of the Nigerian Army Officers Wives Association (NAOWA). It was during her twenty-month presidency that her leadership qualities were first unfolded to the public as she mobilized her colleagues to embark aggressively on public spirited ventures which included building schools, clinics, women's multipurpose training centres and child day care centres. An inclusive thinker and passionate lover of nature, gardening, birds and home decorations, she is a “a poets dream” and with disarming charm and an admirable deft blend of winning wit, quiet confidence and child-like grace, she has brought the institution of first-ladyship out of the closet to active participation in nation building.